Assoc. Prof. Simon Dobrišek, Ph.D. Visiting professor at the Pattern Recognition Laboratory of the Department of Computer Science, University of Erlangen (2018). Organizing chair of the EU FP7 HIDE Project Policy Workshop (2009). Project manager and principal researcher of the EU FP7 project SMART (2011-2014). Project manager and principal researcher of the EU FP7 project RESPECT (2012-2015). Simon Dobrišek received his B.Sc., M.Sc., and Ph.D. degree in Electrical Engineering from the Faculty of Electrical Engineering at the University of Ljubljana in 1990, 1994, and 2001, respectively. He is an Assistant Professor of Electrical Engineering, currently working as the Head of the Laboratory Machine Intelligence of the Faculty of Electrical Engineering, University of Ljubljana. 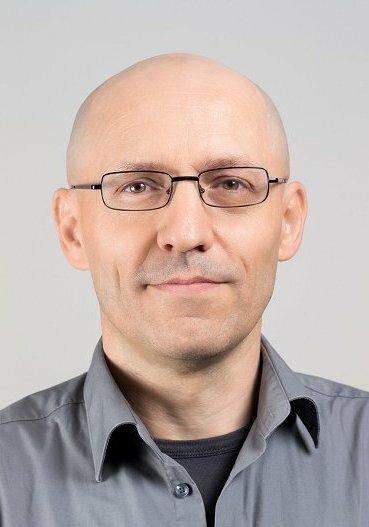 In 1996 and in 2018, he was a visiting researcher and visiting professor at the Pattern Recognition Laboratory of the Department of Computer Science, University of Erlangen, and in 1997, he was a visiting researcher at the Natural Language Systems Division of the Department of Informatics, University of Hamburg in Germany. His research interests center on artificial intelligence, pattern recognition, biometrics, smart surveillance systems, and spoken language technologies. He pays special attention to the development of voice-enabled intelligent user interfaces and biometric surveillance systems used as building blocks of ambient intelligent systems. He is also focused on interdisciplinary research that cuts across the field of cognitive science, linguistics and phonetics, as well as the protection of privacy in the use of smart surveillance and modern information and communication technologies. He has given invited lectures on biometrics and ambient intelligence technology. In the last ten years he has been involved as a key team member in eight national and international ICT projects, and as a project manager and principal researcher in two EU FP7 projects in the field of biometrics, speech technologies, pattern recognition, machine learning, and personal detection technology ethics. He has published popular journal articles and peer-reviewed scientific and conference papers on biometrics, ambient intelligence technology, spoken language technologies, and privacy protection. He has closely collaborated with Tibopo Ltd., the startup that was awarded as the startup of the year 2015 in Slovenia, and that received a Privacy Ambassador award from the Information Commissioner of the Republic of Slovenia for the mDrive system in 2015. In 2002, he was awarded by the Slovenian Fund for rewarding innovation in the field of training, living and work of the people with disabilities for developing the “Automatic reader of newspapers for the visually impaired”.